It’s different from countries to countries, I think in US Growth hormone is still being used in Cow. In Australia is the opposite, growth hormone is used in Chicken but not Cow. What exactly and specifically does “organic” mean? So in the picture comparison of the different chickens, it says “They were ALL raised in the same manner FOR THIS PAPER and were photographed at the same age.” So you started writing this paper in 1957? No, the research paper that I referenced in my article. My question is what is the root of how chickens are bigger now than several years ago? Something has been done to modify them size wise. I could write at least 1000 words here but I don’t have the time. When you defend something…. It would give you more credit to cite legitimate research to back up your statements. Bottom line is why does organic meat taste better? Why the heck do I feel better eating organic? Why are Americans so heavy and unhealthy? I know it’s stress, no exercise, sedentary plus Food. What the heck is in our food? Just think about that. I have cited legitimate resources every article. I also go to school for this, study it and learn it from professors who have their doctorate in it. If you think the meat tastes better, that’s fine. But that’s only your opinion. Chickens grow bigger because of selective breeding. We take the biggest and best roosters and breed them to the biggest and best hens. This causes chicks that are bigger. It’s called an F1 cross. It takes the best genetics from both sides and combines it. I promise there are no hormones in chicken in the United States, because it is illegal and uneconomical. If you choose to eat organic, that’s fine. But conventional Ag is just as safe or safer to eat. It’s all about your preference. Breeding for size, as well as what the chickens consume probably account for taste difference. Larger=tasteless. But a diet of bugs, grass and variety likely means FLAVOR. I prefer organic because it has real chicken flavor. Maybe chickens should be bred with consideration for more than size. And have access to grass, soil, bugs and sunshine! Age is the main factor for taste and tenderness. My husband’s company raises two sizes of chickens for different uses. The larger ones are grown out longer in which case the meat gets tougher. But for a restaurant selling fried tenders, cost effectiveness of getting 6 fried tenders (2 really large tenders from the chicken cut each into 3) is better than growing a smaller bird and only get the two of the same size. Most of the large chickens are sold for parts. The smaller ones are sold as a whole or for the better flavor and texture. They are also more expensive then as you get less for the same amount of processing. I’d much rather have a locally raised organic bird that had outdoor access on my plate than a gmo ridden bird that never saw the light of day! So in the picture comparison of the three different chickens, it says “They were ALL raised in the same manner FOR THIS PAPER and were photographed at the same age.” So did you start writing this paper in 1957? Thank-you for standing up and speaking the truth about chicken farming. It’s a important industry on the Delmarva peninsula supporting many families and their farms..
It’s great that you continue to respond and defend your position! I’m a farmer and I approve of your message! 🙂 Very few will discuss this in a civil manner when those that wish to demonize food production go on the attack. Staying cool about your position shows the strength in your argument. Stay with it! I just wanted to say “kudos” for responding to the comments on your article, instead of just writing an article and moving on. This shows integrity in your journalism and your willingness to defend your position. BRAVO. I only buy organic free range chicken and here is why: it has TASTE! unlike the chickens bred for size, and because of the morality of animal husbandry. Raising chickens in bulk ‘to feed the world’ is not the answer, eating less is. Great! And that is your choice. But I honestly don’t think eating less is the answer. There are way too many people in this country, and world that do not have enough food. Honestly better transportation is the answer. We produce enough food to feed the world, we just have no way to get it to them. The answer is ending agricultural subsidies. Transporting artificially cheap food to other countries destroys their economies and results in more hunger, not less. Subsidies also encourage a system where nearly 40% of US food goes to waste. A good deal of “waste” in food comes from quality losses in shipping and home storage. There are also minor things like the straw from wheat which some people view as “waste” and others as animal bedding. There are actually professional handbooks for food processors, dietitians, and others that detail how much of a specific item will be waste despite best practices. Corn has cobs, it may also have undersized kernels. Note that the US has been a net food importer for decades – we import more food than we export. Organic Free-Range birds are grown the same way as “regular” commercial birds. Unless you are buying birds from locally-grown companies (like at a farmer’s market), the only difference is their diets. The free-range birds are still kept in commercial houses, they just have access to outside areas with grass. How the birds are raised and kept doesn’t really affect the flavor of the meat. Diet is the main factor in that. I am glad that you are able to buy the chicken you like the best, but I did want to add a little more information. Lol. I suggest more research. Your chicken has a bigger yard. The diet is the same. Space of said chicken does not change its taste. I find it offensive when affluent people advise poor people to eat less if they can’t afford to buy the far more expensive pastured or organic foods. Your lack of concern for other people is really disturbing, given your claims of compassion for animals. Have you seen Food Inc? I would certainly recommend watching it to get a more rounded view of the chicken and food industry. The vast majority of chickens are not out pecking around in the dirt that’s for sure, even if there are some great farms still out there! Food Inc ALSO goes straight to the source for the truth, the chicken farmers themselves. How can this not be a reliable source? These farmers are controlled by huge poultry companies that produce the majority of chicken meat for consumption in the US and conditions for these birds are shocking to say the least. You haven’t seen these conditions for yourself ? I am not surprised, as these types of facilities are never open or on show to the public. If you want to be sure of what you are eating and at the same time make a difference, then eat only free range, organic chickens. I have seen Food Inc. But I have also visited poultry farms. And I know poultry farmers personally, and they are not “controlled” by huge companies. Companies bring them chicks and they raise them. That’s how an integrated system works. The conditions at the farms I have visited have not been bad. I haven’t gone to every single poultry farm in the nation, or even in my state, but I have been to quite a few and they’re all good conditions, not perfect but good. You have the choice to eat free range, organic chicken, and I have no issue with that. But that will not feed the world, we eat way too much chicken for everyone to have free range, organic. It is not possible. We just plain eat too much. Food Inc. is an awefully produced, biased movie. I have plenty of neighbors, family and friends that farm (crops, livestock, and poultry) and Food Inc. is a gross inacurate description of what goes on. Watch the movie Farmland. It is an unbiased film on farming. My husband is an animal scientist specializing in poultry. We watched Food Inc and after watching the part about poultry, we really questioned the validity of the rest of the documentary. Poultry companies hire contract growers. This means, poultry companies will pick the breed of chicken, contract growers to grow them out for them (even supplying the food) then will pay them based on weight and feed conversion once the chickens are picked up for processing. The grower then has to take that gross payment and pay the bills occurred during the time of grow out. For instance their gas bill may be higher in the winter with heating or their electric may be higher in the summer due to ventilation. They then get to keep what is left of the payment. The grower is obligated to adhere to animal welfare regulations and bio-security. Most growers are fantastic with this. They make sure that their birds are healthy and looked after by being in the barns, checking on air quality, on temperature etc. They usually get paid more because their birds perform well. Then you have growers who do not put in the extra work, or do not want to pay out more for keeping the birds comfortable. This was very evident in the Food Inc doc. The birds were clearly hot and not looking well due to lack of ventilation and a number of other problems. Most companies will give growers like that a warning and a list of things to fix with a time frame in which to fix it. If not, the grower will loose their contract. Majority of poultry companies would terminate a grower like the one portrayed in Food Inc. Those are the kind of people that people should be upset with and go after. The growers that are more interested in easy money (as in just doing enough to get paid) rather than the welfare of animals. Those are the horrible people. Before condemning the poultry industry based off of a one sided “documentary” educate yourself. Talk to farms, tour a poultry farm. I personally grew up in Metro Detroit, far away from such a world. It wasn’t until I met my husband and was more immersed in agriculture do I now really know where my food comes from. This is an excellent article. Thank you for posting it. I can’t tell you how annoyed I get when people go on the whole “hormones in chicken” rant. I prefer to go straight to the source for the truth. I have visited a number of farms and none of them look like food inc. Sadly food inc is not a truthful representation of the poultry industry. Growthhormoneuk.com has emerged with an objective to serve for wellness of people with high quality medical products made by the international leading brands. The video does not show cage raised chickens because the video is talking about raising chickens for meat, not eggs. Chickens raised for meat are not raised in cages. The pictures in the video are very typical of how broilers are raised. I think this is a great article, I also tried to circulate the link on Facebook because it contained factual information. Facebook removed the link from my page, it is very disappointing to see they are editing the truth but allowing so many to post links to information that has no science based information. Thank you for your support! I am in the process of figuring out the facebook thing, it is an issue everyone is having. Thank you again for the kind words! Facebook just now allowed me to post your blog. Thanks for your hard work and Great job at spreading the truth. Great! Thank you! Im glad Facebook has resolved their issue. You have apparently angered lots of people as one suddenly cannot share the link to your blog on facebook. I have submitted to them that it was in error and I hope many others will as well. Keep up the great work and keep making them mad!!! Thats interesting. I was unaware that this had happened or could happen. Thank you! Yes, it was strange. I shared it and had gotten a couple of comments and then a friend texted me about it. When I went to open facebook again, my account was locked and I had gotten emails that “suspicious activity” had been detected on my account. At first I didn’t put the two together. Then I noticed my post was gone. I checked my friends pages that had shared it originally and it was gone from their pages as well. When I attempted to repost, I got the message that the link I was trying to share had been blocked. I was able to post just the link to thetruthaboutag.wordpress.com, so I did that and directed people to the correct article. I’m speculating, of course, but I bet your detractors reported the link as unsafe, etc. Well since you posted this I went to my Facebook and I am locked out. It will not let me log in because of suspicious activity. I dont know why this is happening, but it is not normal. I’m pretty sure my link is not actually spam so someone must have reported it or something like that. That’s absolutely ridiculous! I posted on my facebook about your link being blocked and it was removed, etc from several other of my friends’ pages. (I’m an animal science PhD, as are they) We’re all pretty ticked off on your behalf. If you find out there’s a way we can speak up on your behalf, let me know and I’ll spread the word. Thank you so much Pamela! I really appreciate the support! This is what I just posted on my Facebook. “Hey y’all I don’t know if you’ve noticed, but if you shared my blog about hormones in chickens the other day Facebook has deleted it from everyone’s timeline and blocked it from being posted again. As of right now this is the only way I know how report this specifically. Maybe if we annoy them enough they’ll unblock it. I would love for you to share this on your page as well! I wish you the best. Don’t let em brain wash you too badly, k. Try and learn the difference between a real farmer and a factory operator. The practice of husbandry is of utmost value to nature and people. I think I understand why you didn’t post my reply. If I were you I probably would have been to embarrassed to post it. I grew up in a poultry town in the south. I know exactly what practices are used in the chicken farms/factories. I did approve your reply. I am in the process of responding to it. And just because you grew up in a poultry town doesn’t mean you know all about the practices. The video shows no cage raised birds. As an individual that has spent many hours in the nations leading chicken producers facilities, I feel the video is misleading to the average viewer. Also, if “feeding hormones to poultry is digested and turned into amino acids” thus rendering them useless, is a fact, then why did the FDA feel the need to create a law against it. I am not trying to start a debate, I just hope you find another video that is more “real” and supports your point without deception. For the record, im not against your point. Just bringing a few details to your attention. Also, is it 90 minutes, or 1 time per day. Either way I understand how it would not be feesable. Just curious as to what timeline is correct. Keep up the good work and keep us informed! Thanks for your feedback Darren! I’m not sure why this video does not raise cage raised birds, it might be because it is the short version of the video. The long version has a lot more information, but it is a little too long for everyone to watch. I do see how it could be misleading though. It is my understanding that the FDA made a law against hormones, before research was done realizing that they are ineffective. This video is the best one I found that clearly and shortly explained the topic, so that is why I used it. But I do understand how it could be confusing thanks for that! Also I’ve always been taught that injections would have to be given every 90 minutes because of how the chickens body works. Thanks for your kind words and your feedback! I appreciate it! My agenda is truthful and helpful. Your agenda is self serving and misleading. It’s either genuine ignorance or pure greed. I’m not against big biz. I’m actually a capitalist. I just don’t support unjust weights and balances. It’s an inferior product period. I dont believe that is the truth. But thanks for your feedback. It is neither ignorance since I am in college studying this, or greed because I have very little money, as is the same for most farmers. But thanks for your feedback. Ok whatever. I know more than you though. Is there a link available to the video you mentioned in your article? Thanks for posting! Good stuff! Thanks for helping to correct some bad info out there. There is also much bad info on beef and dairy. Thank you Paul! I have already addressed some issues on beef and dairy in my earlier blog posts, but I am going to write even more about them in the future. Loved the article! Ready to read more like it. I’m also interested in GMO, which were not taught about back when I was in college. Also the topic of importing food(meat, vegetable, fruit) to the US… Is it truly safe? Regulated? Actively/routinely evaluated? Thank you for the information! Thank you so much for your kind words Missi! I will be working on a post about GMOs soon. Along with antibiotics in chickens. I think the topic of imports is a great one! I will do some research and then write a post. Thanks again for taking the time to learn the truth about ag! Very well-written article. I agree that the “health-washing” labels are completely misleading to consumers. I look forward to reading your next article about antibiotics, as I try to buy antibiotic-free meat. How about the GMO feed they are undoubtedly fed? Do you plan to write an article addressing this issue as well? Thank you Rebecca! I will start working on my antibiotic article soon. I might work GMO feed in there as well. Thanks for the idea and support! very interested to read articles on GMO Feed and antibiotics that are given to chickens! Thanks for the information. There needs to be lots more information like this advertised. Most all people have been brain washed by the animal rights activists. I have a degree in poultry science from Auburn and have worked in the industry for years. I currently raise Pullets for a company and everyone who knows my background ask me about the safety of their food. I tell them exactly what you have stated in this article but they still have their doubts. Most who are 35 and younger are miss informed about all of agriculture. They want free range chickens and grass fed beef because they have been convinced that all the rest is bad for you and is causing all sorts of ailments. 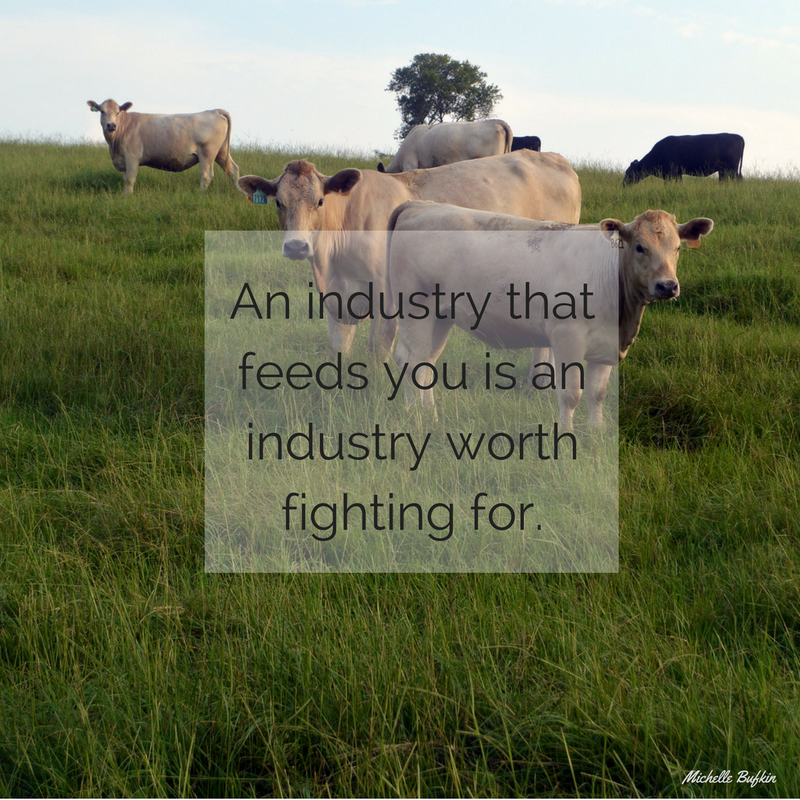 It’s time that consumers know the truth about their food and agriculture. Thank you for your kind words Shannon!! Thanks for the support of my blog, the poultry, and ag industries! No growth hormones in chickens is obvious, but I find it Interesting that the article does not address the use of antibiotics as growth promoters and the now documented long term effects of this practice that include antibiotic resistent bacteria among other negative impacts. I don’t believe that growth hormones is obvious because I’ve talked to numerous consumers that were not aware of this fact. The reason antibiotics aren’t addressed in this article is because it is a separate and different topic that will be covered in another post. Thanks for your feedback though! I will follow up with a post, explaining about antibiotics and the fact that they don’t cause resistant bacteria in humans. Thanks for the idea for another post! Interesting article, and it’s nice to know my chicken has only the hormones it produces naturally. But there’s one point I have to question. Dr. Berry claims that “Growth is complex; no one hormone can affect it.” Ask the parents of any growth-hormone deficient child whether a lack of just that one pituitary hormone affects their child’s growth. Dr. Berry also says, “The injections would have to be given every 90 minutes to be in correlation with the pulses of the natural hormones in the chicken.” Er…why? When growth-hormone deficient children are given GH replacement injections, they do it once a day at bedtime, and it works very well. When bodybuilders abuse HGH, they take it once or twice a day for a set number of days, not every 90 minutes (or whatever the cycle is in humans). Sounds to me like Dr. Berry was overstating his case quite a bit. I’m not sure about the one no one hormone can affect it, because that is Dr. Berry’s area of research not mine. But the reason that they would have to inject it every 90 minutes is because of how a chicken’s hormones work. You compared them to humans, their bodies do not function the same way. This is a good post and completely true to fact. 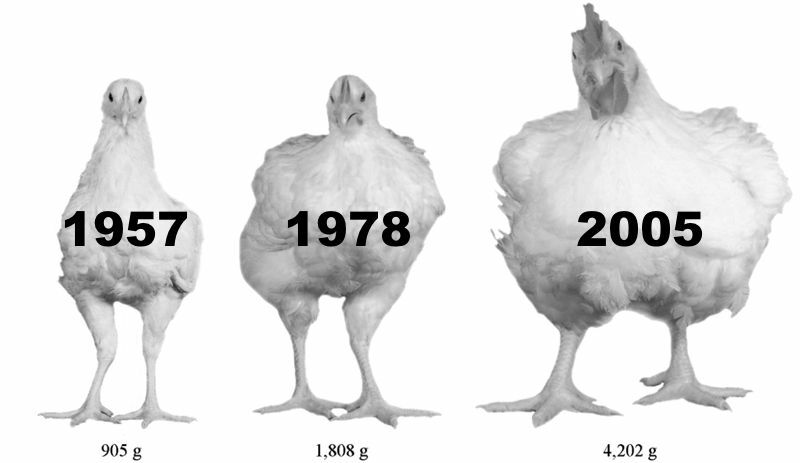 However, chickens didn’t just “naturally increase size over time.” They were very heavily genetically selected to grow faster and bigger over the past 50-100 years. This was a purposeful and very effective way to feed more people for less money. However, it has had negative impacts as well, of course. Thanks for the feedback! I talk about selective breeding in my article. When I said that chickens naturally increased over time I meant, specifically that they have not nor have ever received any sort of hormones. But I do see how the way I said it could be misunderstood. That their growth “just happened” but like you said, it didn’t just happen we made it happen by being selective with how we bred chickens. Thanks so much for clarifying that! Thank you for that information. This is good to know. Of course! Glad you enjoyed it!! Your article itself is the only thing I found misleading. You would have been better off doing a write up on FDA specifications, instead of trying to mask the harmful effects of eating non organic anything, let alone chicken. IMO everyone has an agenda. We all go through life with some sort of bias, just as you have shown with your comment. It’s just life. The reason chicken feed is not addressed in this article is because it is a separate topic. I will be writing a follow up post focusing on GMOs and antibiotics in chicken feed, so please feel free to come back and read that. You mention synthetic testosterone and estrogen, you are correct that they show up in blood tests, but chickens are processed before their hormones are completely kicked in, so the FDA would still be able to tell that hormones are being used, and then the producer would be shut down. You also mention that I should have written specifically about the FDA specifications, but contradicting that you earlier said that its like taxes, people still cheat. So I believe I wrote about the correct things when I spoke about how hormones aren’t used because they aren’t effective or efficient. Thank you for your overall feedback. I appreciate any feedback negative or positive, because both help me grow as a writer so thank you! I understand your concern of GMO feeds that are often fed to livestock and poultry, but the aboslute truth is that there are no more Xenoestrogens found in GMO Soy Beans, which numbers to about 245,000 nanograms, compared to organic soy beans. Same goes with cauliflower, broccoli, and just about every other vegetable or legume you can think of. So think about your coment when you feed your vegetable table scraps to your back yard chickens or see someone else doing it. Yes they are feeding Xenoestrogens to their chickens. Thank you for this Jonathon. I appreciate the information! You have clearly ruffled Tim’s feathers here. Obviously it is because he “knows more than you”. Just ask him, he will tell you. But I guess he already did. Tim, my suggestion is if you see errors, write your own blog countering them, then post a link here. My guess is Michelle will let you do so. Thank you so much for your kind words Carolyn! Feel free to follow my blog for posts similar to this in the future! Thanks for all you do for the poultry and ag industry! Have a great day as well!